After Monday’s close, highflying FAANG stock, Netflix, reported very disappointing subscriber growth. It was a shocker. The company’s stock plummeted after hours, over night, pre-market and as stocks opened Tuesday morning to the tune of 15%. 15%! That’s almost a crash. The tech-laden NASDAQ 100 followed suit and the selling spilled over into the broad market as you would expect. Analyst after analyst and pundit after pundit uniformly poured ice cold water on the technology sector with the most positive person calling for a much needed pullback while the negative Nellies called for a bear market, crash and 50%+ decline. I don’t recall hearing a single person advise buying the dip. That was so interesting because buying the dip was the strategy that was immediately rewarded, almost to the minute. Below you can see charts of Netflix and the NASDAQ 100 with each bar representing 5 minutes. It was the single most dramatic turn of events in the NASDAQ 100’s history with the index closing at a new high according to my friend and data miner extraordinaire, Jason Goepfert of sentimentrader.com. While I certainly don’t want to put too much weight on a single reaction to one earnings report, it does speak to the underlying strength in the tech sector and how difficult it will be to ultimately kill this bull market. Impressive behavior is an understatement. With all that said and gushed, none of the recent short-term concerns in the rest of the stock market which I have discussed of late have been eliminated. Banks and semis are a little better. Discretionary continues to chug along. Junk bonds are hanging in. If you follow me on Twitter, you know I wasn’t enthralled with Friday’s session. While price action in the major stock market indices was strong, more stocks were down on the day than up. Additionally, banks reacted poorly to earnings and high yield bonds closed at their low of the day. Again, it was only one single day, but there was some mild weakness beneath the surface. On the sector front, there isn’t much new. Discretionary is the lone leader among the four key sectors. Semis and transports continue to be the most frustrating for bulls and bears as strength is sold and weakness is bought without much progress being made by either side. 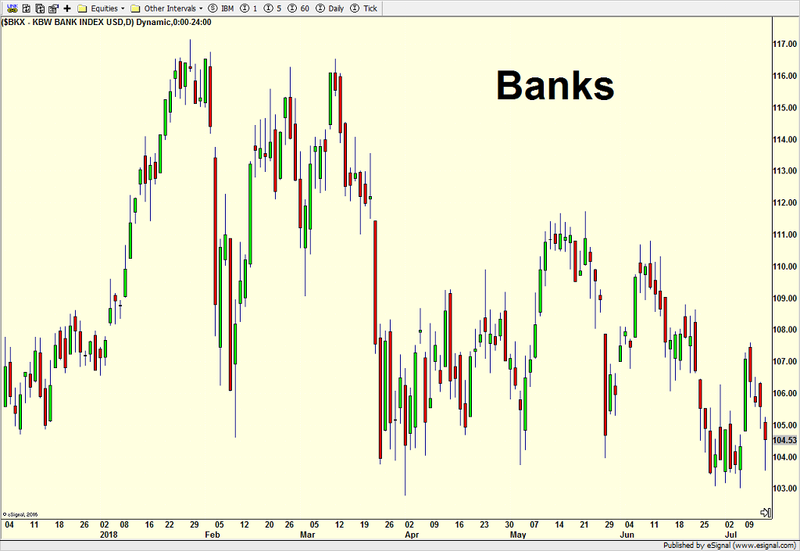 Banks are a little weaker as they head to the lower end of their range. With earnings being released on a daily basis, we should see some large moves. As I mentioned on Fox Business with Charles Payne the other night, the most bullish thing the banks can do is to go up in the face of bad news. That kind of behavior could signal the start of a major rally in financials which would certainly juice the broad market. Trapped Again. What Do the Bears Do Now??? Following up from the piece earlier this week, Bull Markets Don’t End Like This, the path of least resistance continues to be higher even though the Trump administration added tariffs on another $200 billion in Chinese goods. As you would expect in the most powerful bull markets, the news was just a one or two day pullback/pause after stocks had appreciated 3% over the previous four days. In other words, it was yet another in a long line of bear traps. I still cannot get over how many people absolutely refuse to analyze the data and believe the facts. They either became negative way too early or never even got off that mark after 2008. If you get sucked into the rhetoric instead of reality, I guess the consequences are severe. Now, don’t get me wrong; this whole tariff war is going to end badly for everyone involved. Unfortunately, I feel confident about that. However, that day isn’t today or tomorrow and stocks still look attractive, appealing and like they want to move much higher first. The Dow Industrials have finally started to show signs of leadership. We will have to see if that’s real or fleeting. After that the NASDAQ 100 is the leader. Unusual combination? Yes, but as long as we have some of the relatively riskier assets leading, that’s okay. Ultimately, the S&P 400 and Russell 2000 will die before the rest and the Dow should one of the ones left standing at the end. Finally, it would be nice to get the high yield bond sector moving, even though I strongly believe it has peaked for this cycle. That’s okay, though. There is still money to be made here using shorter-term time horizons. 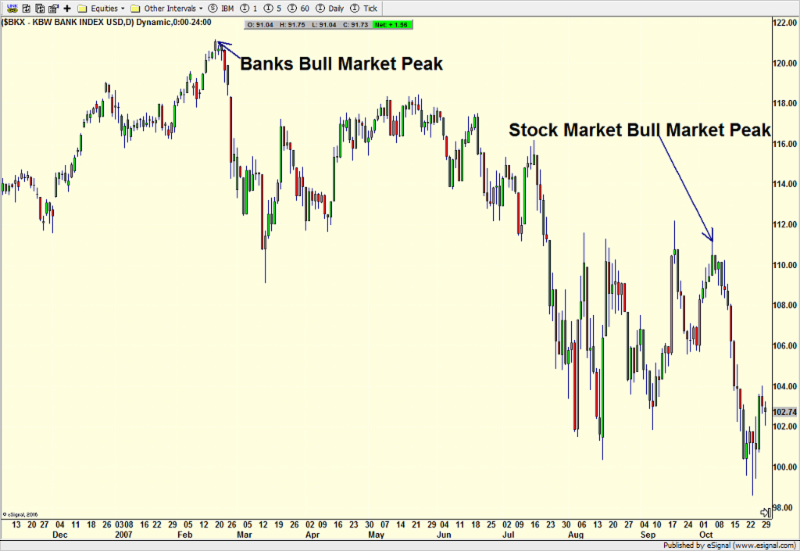 Over the past week we have seen two decent signs of the low along with two disappointing signs for the bulls. On Thursday, it became clear that the bulls were just teasing the bears and that the path of least resistance was higher. I was also heartened that one of my primary short-term models turned positive before the July 4th holiday. From here, I fully expect the S&P 400, Russell 2000 and NASDAQ 100 to score all-time highs this month. I think the S&P 500 will follow suit this quarter. The Dow Industrials have been lagging all year as the Trump tariff tantrum weighs heaviest on that index. I still believe the index will see all-time highs, probably this quarter, and should finally lead if there is any break in the tariff dispute. While high yield bonds have struggled mightily over the past month, they have perked up a bit over the past week. However, they are back to stinking and remain my biggest concern for the long-term health of the bull market. I do think this canary has died for this cycle. 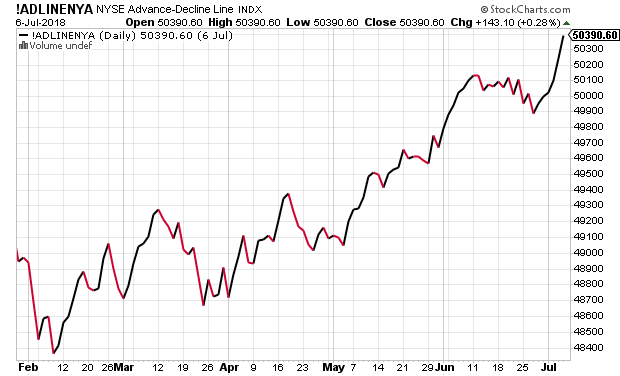 Finally, the best news of the day is that the New York Stock Exchange Advance/Decline Line has surged back to all-time highs, a condition that typically insulates stocks from a bear market, at least 90% of the time. While it’s not foolproof, a 90% accuracy rate is good enough for me. The perma-bears and bear market proponents are barking up the wrong tree, for now. Stocks ended the month of June with the bears showing a tiny bit of teeth during the afternoon as the major stock market indices gave up most of their gains. The multi-week June swoon looks to continue at the open on Monday as more of the Trump tariff tantrum weighs on stocks with Canada now fighting back. Semiconductors also have some negative news and that supports my concern of leadership change from the the NASDAQ 100 to perhaps the value stocks. As I mentioned last week, banks got through their stress tests and looked to run sharply higher as trading began on Friday. That celebration was short-lived as sellers came in and closed the sector at its lows for the day. It is certainly not a good sign when a beaten down sector can’t rally on good news. Couple that with a flattening yield curve and lower intermediate-term interest rates, the banks are concerning me and will continue to do so until they show some leadership. By the way, when I write about the banks, I generally mean financials although sometimes their paths diverge. 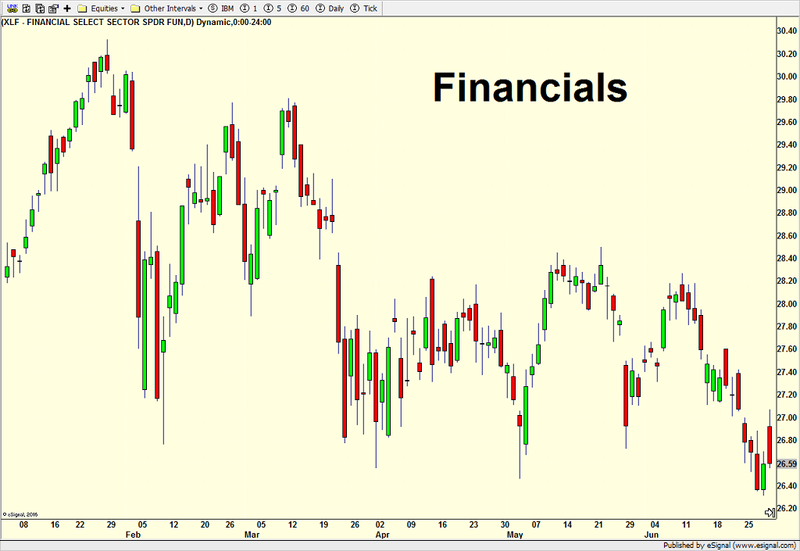 The broad-based financials are below and you can see that both sectors move pretty much in lock step. Banks & Transports Still Tired. Modest Pullback Here. Last Friday, I discussed what appeared to be tired behavior in the banks as they were selling off on good earnings news after rallying sharply into earnings season. Citigroup and JP Morgan were the examples. This morning, Goldman Sachs and Morgan Stanley beat earnings expectations, yet reaction has been muted with the former opening sharply higher and then selling off while the latter is hanging tight. I would not be surprised to see Morgan Stanley buck the trend in the short-term and finish better than its peers have. 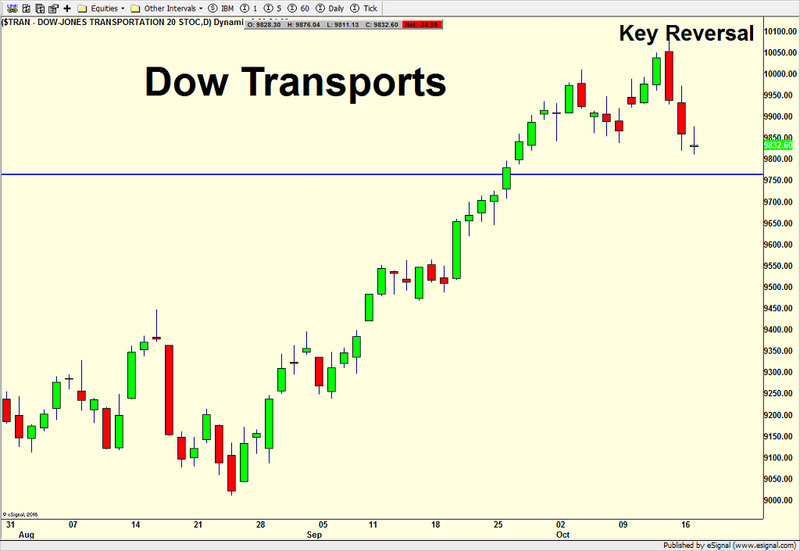 Another one of my key sectors, transports, is following through to the downside after seeing its own “key reversal” last week, another sign of a tired sector. While I am not looking for a substantial decline in either sector, I do believe the upside is now capped and the best case is some sideways activity for a few weeks. On the stock market index side, I continue to be of the opinion that an October pullback remains in the cards as I have discussed for the past few weeks. Nothing big or traumatic. Just a modest, single digit bout of weakness. 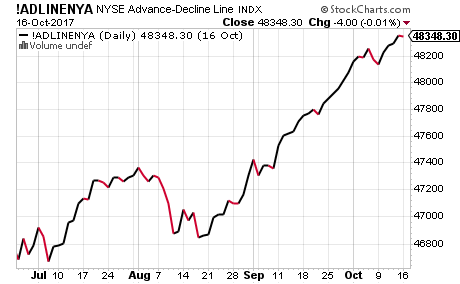 On Monday with new highs in the Dow and S&P 500, there were more stocks declining than advancing on the NYSE. That comes off an all-time on Friday in the NYSE A/D Line. While one day does not amount to much, it does support my over theme of a slightly tired market. 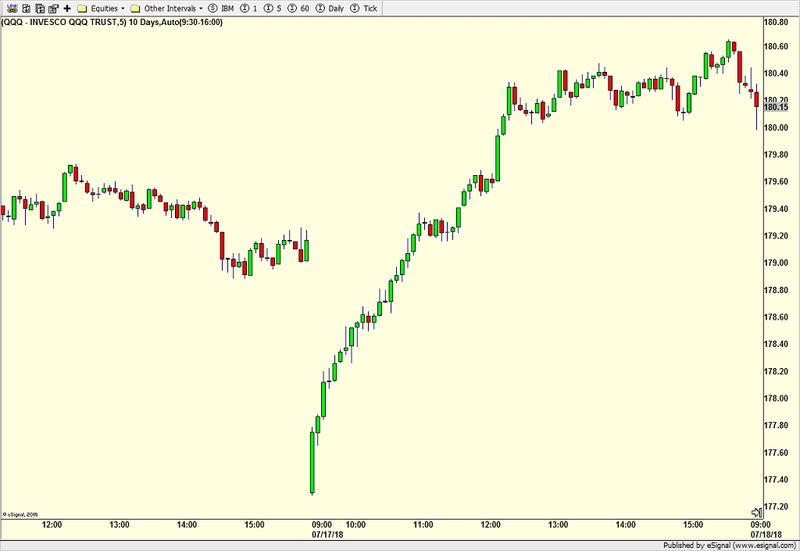 Since late July I have been in the camp looking for a trading range with a mild/modest pullback. I remain of that opinion today. Should stocks gather themselves and score fresh new highs this month, I think it will be a good opportunity for the nimble to sell for a modest move lower into October. All along, I have written about a mid single digit pullback and that’s still my target. I do not believe we will see a 10%+ decline and certainly, the bull market is not over. I am not going to rehash my rationale for why a trading range/pullback and why so modest right here, but I do want to add color to a previous concern, the banks. 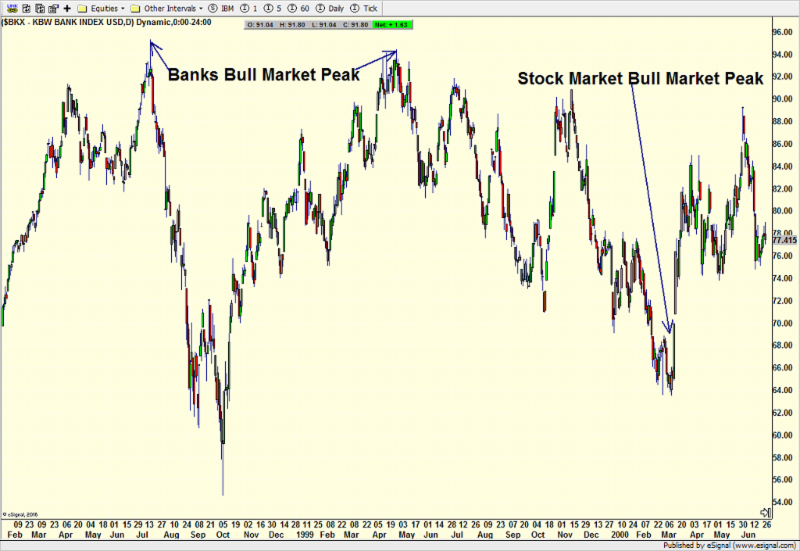 As you know, the banks/financials are one of my four key sectors to a bull market’s health. The others being semiconductors, consumer discretionary and transports. 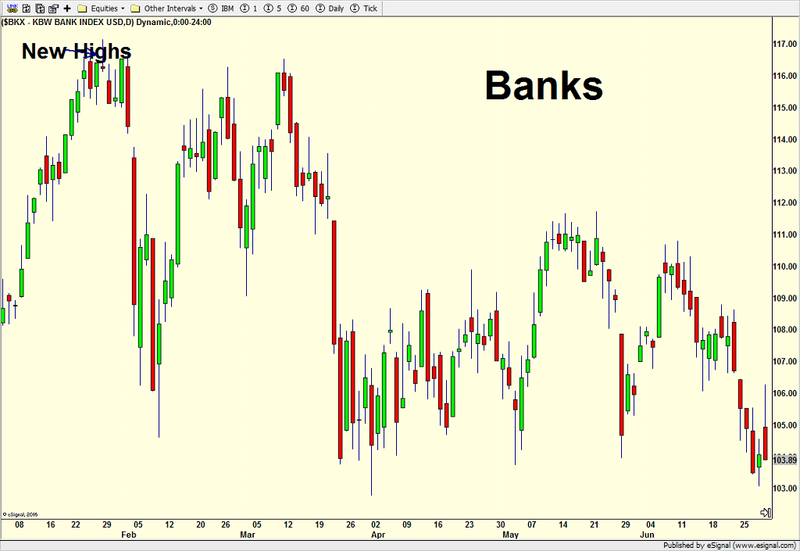 Remember that the banks peaked in February 2007, long before the stock market did in October as you can see below. A 2 1/2 year, 50%+ debacle followed suit. Before the Dotcom Bubble burst in 2000, the banks double topped in July 1998 and April 1999 before the bull market ended in March 2000. A 50%, 2 1/2 year collapse ensued. Last week, the banks were at their lowest level in three months while the S&P 500 was one good day from all-time highs. That’s not exactly healthy behavior and can lead to some kind of trouble for stocks. 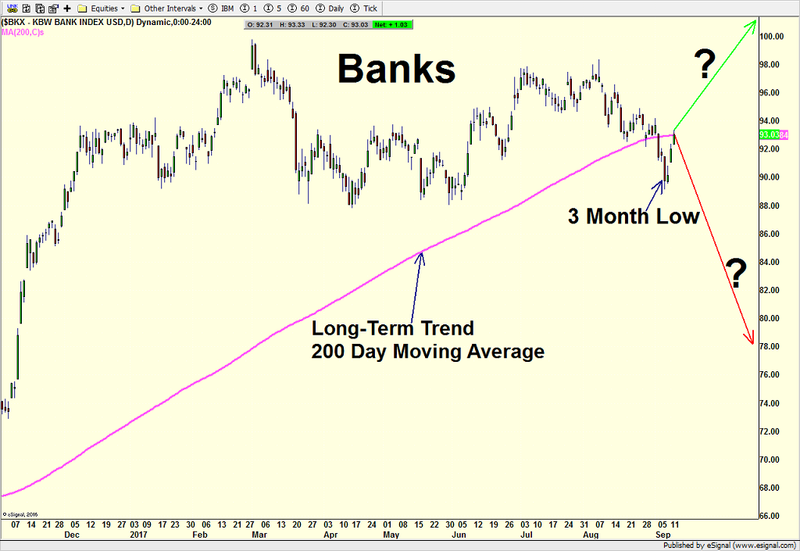 Additionally, the banks had also sunk below their long-term trend, more popularly know as the average price of the last 200 days (200 day moving average). However, let’s also remember that not all poor behavior by the banks leads to a 50% or even a 20% stock market decline. As the new week began and Hurricane Irma’s ferocity did not cause the damage expected and certainly not the worst case scenario, stocks opened with a relief rally that ended up powering higher all day. The banks were a leader. This morning, as I type this, banks are once again leading and have rallied right back to the pink line or their long-term trend, giving a sigh of relief to the bulls. You can see that important chart below. However, nothing has changed fundamentally, not a single thing, or really technically for that matter. And the Fed is still slated to announce their balance sheet taper plan next week with the likelihood of one more rate hike in December. Bank earnings are unlikely to accelerate from here. The economy’s output has improved as I have been writing about all year, but a recession still looms in President Trump’s term. The three month low does not look the a low of significance or not the ultimate bottom. It appears to be just a spot for a bounce before moving lower. It will be interesting to see how price behaves now that it has bounced. Bulls really want to see the group close above the pink line below (long-term trend) for a week straight. Failure to do so will likely result in the pink line beginning to trend down with price beneath it. That’s a bad set up. Also, the price lows for 2017 are at the blue line, another line in the sand the keep a close eye on. The final area of the chart above I want to point out is the far right side where I have red and green lines with question marks. I am being the master of the obvious to say the banks can go in either direction, but I really do think there is a binary outcome from here although it isn’t likely to be in straight line fashion. I just don’t see the sector staying in that trading range. It’s either going to breakout to the upside or breakdown. The next few days and weeks are likely key although a massive breakout of significance will oftentimes begin as a fake out in the opposite direction first. On May 8th, I first started discussing what I saw as a skewed risk/reward ratio with 500 possible points of upside and 1000 points possible on the downside. Over the years when there was a decent chance for stocks to decline, I often referred to it as a window of opportunity that stays open for a period of time before closing. Three weeks after my comments, stocks have basically gone nowhere. We saw a brief dip when the “hysteria” over Russia and Jim Comey came out, but as I said at the time, it’s reality over rhetoric and the markets and economy don’t really care about all the nonsense. With high yield bonds and the NYSE A/D Line at fresh all-time highs, the window for a decline is quickly closing and may be closed. The longer we go without another bout of weakness, the less likely it is to happen. The leaders keep on chugging and the laggards show no signs of stepping up. In short, stick with what’s been working until proven otherwise. Semis, tech, industrials and discretionary. At some point, energy is going to stop behaving so poorly, but I want them to prove it. With oil up from $44 to $51, the energy stocks have barely lifted their head. That’s just plain ugly and perhaps getting to the point where it’s so bad that it becomes good. The markets begin the week with little changed from last week. Volatility remains absurdly low, but remember, regardless of what you hear on the financial shows, markets do not go down just because vol is low. And bull markets do not end with vol so low. The major stock market indices are not in sync. The Dow continues in its range but looks to be testing the top of it. The S&P 500 should try to poke above its range and test all-time highs. The S&P 400 and Russell 2000 have pulled back the most and stopped exactly where they needed to to remain healthy but lagging. And the NASDAQ 100 remains the lone big winner, continuing its unabated, nearly vertical move higher. While nothing here is worrisome overall, I would rather see the majority behaving similarly. On the sector side, it’s more of the same with transports and banks looking alike and needing some help. Discretionary is close to all-time highs and needs to get there this week while semis, like the NASDAQ 100, just continue to blow off higher. All year long, I have talked about reality over rhetoric when it comes to DC and Donald Trump. Don’t get caught turning negative like so many have before because of the president’s unique behavior. It’s not relevant to the markets nor economy. The economy should print is a very strong number for Q2 and Q3 and the employment reports are solid. Of course, so are the markets although I continue see more limited upside than downside. We saw a fairly strong selling wave on Thursday during the first hour of trading. However, by mid afternoon, the bulls stepped right back up and recouped all of the losses before closing modestly lower. Their resilience continues. Given how most of the major indices are positioned, the bulls need to score new highs sooner than later to reset the clock. On the bears’ side, a close below Thursday’s low should set a deeper pullback in motion. That’s the one I have had my eye on since last week. Sector-wise, it’s more of the same, however, the banks are under more pressure and may be in jeopardy of a decline to new lows for 2017. That would certainly weigh on the stock market. High yield bonds, on the other hand, remain solid and that’s why I am not looking for much more than a modest decline towards Dow 20,000.